Welcome! I’m Mike Williams and obviously I love fishing. I’m the proud father of two amazing kids that share not just my love of fishing but of hockey. When I am not fishing or at the hockey arena, chances are you will find me hunting or just enjoying the outdoors with my kids. Growing up in the area has given me the opportunity to gain a great deal of valuable fishing experience. Sharing this knowledge with you I promise a day on the Kawartha Lakes that you won’t forget. Although I can’t guarantee you a catch, I can guarantee that your adventure will leave you with a smile on your face and lasting images of the Kawartha Lakes. I look forward to sharing an exciting day of fishing with you. 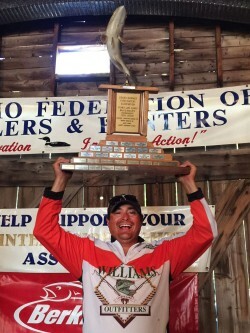 I have been a professional tournament fisher since 1995 and guiding since 1996. During the fishing season, and when I’m not guiding, I compete in regional bass fishing tournaments such as: Top Bass Fishing Series, Canadian Fishing Tour, Bassmania, FLW Canada and the Bass Champions Tour. I also support local fundraising fishing tournaments such as the annual Curve Lake Old Timers, Stoney Lake and Emerald Isle Fishing Tournaments. In addition to this, I organize the last bass tournament in our area (called “The Last Cast”) to raise funds for our community’s hockey team. Over 20 years guiding and tournament experience.